Most historic districts in this country consist of small sections of a larger more developed city. The Mendocino Historic Preservation District consists of the town itself and this creates a dynamic that is evident as one walks the streets. While visitors come to enjoy the historic townscape, the residents are also using the post office, the library, the school, and the grocery store. The town has an architectural governing board that reviews all town plans to ensure the visual presence of this historical town is preserved. 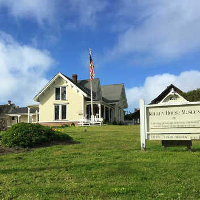 The Kelley House Museum, in keeping with historical preservation, is furnished with period furniture from the late 1800s. The three upstairs bedrooms are furnished with items that belonged to the Kelley family or came from the period in which they lived in the house. In 1850, the Baltimore-built Clipper Frolic, en-route to Gold-Rush San Francisco from China, wrecked on a reef just north of today’s Point Cabrillo Light Station. Her story is among the most fascinating in California shipwreck history and is called “the most significant shipwreck on the west coast” by historians. Artifacts and interpretive materials from the shipwreck of the Frolic are on permanent exhibit. “Then and Now” exhibit portrays the town of Mendocino and its surroundings by comparing scenes photographed approximately 100 years apart. The original photographs, taken by local, amateur photographer Perley Maxwell, were printed by the 2002 Mendocino High School photography class. The students then took modern day digital images of the same location. These revealing images show how things have changed and how some things may never change. Our Native American exhibit offers a historical overview of Mendocino’s earliest residents, as well as an array of photo prints and artifacts depicting their way of life. On loan from the California Indian Museum are six examples of decorative gift and utilitarian baskets belonging to the Daisy Kelley MacCallum Collection. And from the Dorothy Byrnes Leonard Collection are examples of decorative gift and utilitarian baskets, a woven infant carrier, and a duplicate toy cradle.